I also want to ask if you do line art on the hair. My line art is always so obvious any tips? How many years are you doing digital arts? Im doing digital arts maybe half a year already. Do you think I can cach up to you ? Oh my gosh! This is amazing! Karuta is really cute and pretty but I love the background with the skeleton! It's so cool! May I have your permission to use the background! I will most definitely credit you! You are so talented and amazing with your artwork! CUTE! she's my absolute fav! i love inuxboku ss. 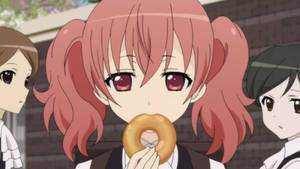 karuta is one of my favorite characters. "Would you like to eat, or be eaten?" Love this <333 I was so shocked in the anime when she turned in to the skeleton.